Fall is in the air—and all of those fun fall holidays and gatherings are quickly approaching. Here in our corner of the world, we love the Autumn months and have hosted too many Halloween parties and Thanksgiving gatherings to count! As soon as the girls are back to school, it is always time to turn my attention to fall party planning—both at home and at the girls’ schools. What is first on my fall, party planning, to-do list? I need to check out the fall themed greeting cards and invitations at Tiny Prints. 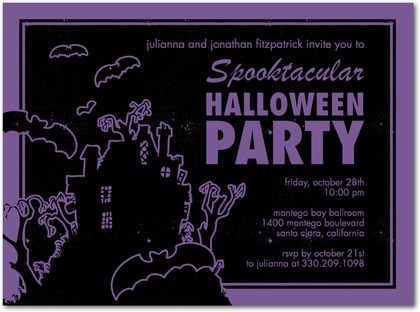 Tiny Prints is one our favorite online greeting card and invitation sites. I used Tiny Prints for the first time for party invitations for our middle daughter several years ago—and find myself returning again and again. 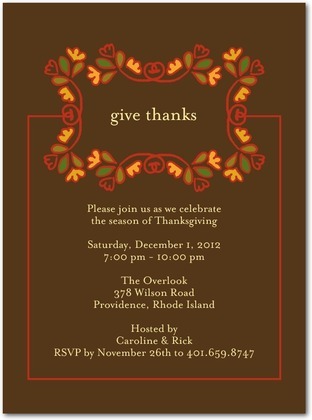 I adore specialty invitations and personalized, photo greeting cards. I love Tiny Print card styles—and the finished products have always turned out wonderfully. What cards will be heading out to our guests and family members this fall season? This would be perfect for our larger party—since we have kids and parents both on the guest lists. Not too grown-up—and not too child-like. 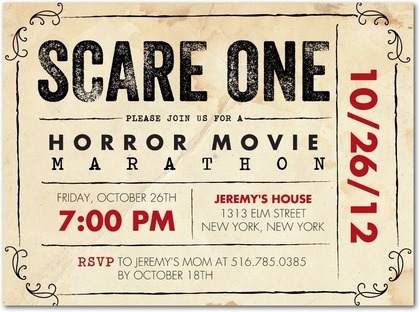 The younger girls always want to host movie marathon sleepovers—this would be just the ticket for that, right? I could look at Halloween invitations for days—but, with Thanksgiving following so closely behind—I usually try to choose all of my fall invitations and greeting cards in early October. 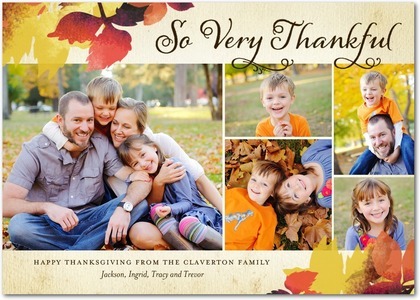 I love the selection of thanksgiving photo cards at Tiny Prints. 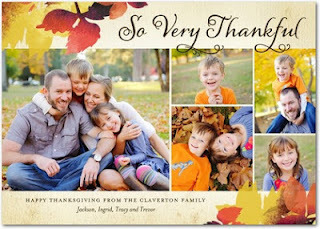 I have oh, so, too much fun finding photos and choosing the design for our fall and winter holiday greetings! With three kids—I always choose photo greeting cards, like this one, designed for multiple photos—it’s just too hard to only share one picture of the girls with our friends and family! 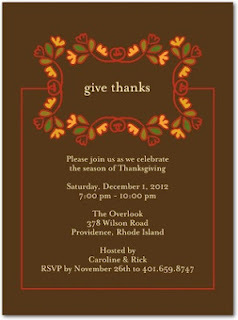 I am still in the process of choosing our thanksgiving invitations—these are top three finalists—all from Tiny Prints. 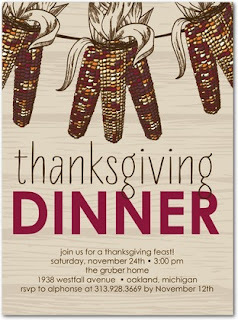 This Thanksgiving invitation is unique—and I always decorate with maize, so it seems like a nice, personal, tie-in. This one is a little more formal—but still gives me a pop of fall color. ….and this one is in the running since we are hosting a Thanksgiving gathering—but, it may not be on Thanksgiving Day. 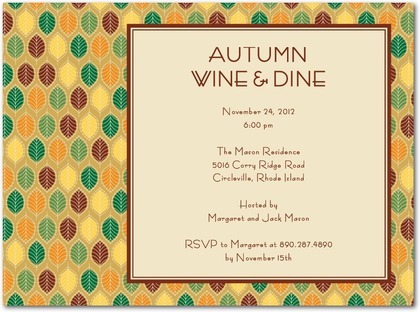 Have you chosen your fall greeting cards and invitations? If not—take a look or two at Tiny Prints. I even took a peek at their Christmas cards while I was there! I'll have to force myself to wait until November to plan our holiday cards! Disclosure: I will receive a promotional credit from Tiny Prints in exchange for this post. I love it when I am able to write about sites and I already use and love. My opinions are always my own—if I write a positive review of a product or company, or publish a list of favorites—then I personally use and enjoy those items or businesses. Thanks for stopping by and following my blog! I'm following you back now! :) Can't wait to read more from you! These are really nice, the photo greating cards really appeal to me. I'll check out Tiny Prints. First time follower via GFC via the hop. Hope you can visit sometime.